Your website is a marketplace, where your sellers advertise and offer services for sale to your buyers. You may have negotiated special deals with your sellers. We have provided for a subscription model, but you can very easily remove those references if a buyer does not have to become a member. This website terms and conditions template sets out the subscription process and the relationship between your business and buyers who use your website to buy. The services bought and sold could be anything. They may be ordered via computer, smartphone, tablet or any other mobile device. We have provided for basic contract procedures, but delivery information must come from the seller as it will not be the same for a personal trainer as for computer servicing or for ditching your farm land. It is likely that you will specialise in one niche, but you could cover a wide variety of services. You do not need to have more than one seller client but we assume that you will. Most of your sellers probably use your services because they do not have an internet facility for taking money or because your marketing service is better than they could achieve. You are simply marketing and collecting money. Because each marketplace website has its own business model, we provide separate agreements for terms with buyers and sellers. You should therefore pair this document with the most suitable seller side marketplace T&C document we offer. Note that we do not provide a seller side document that relates specifically to a membership site because the seller is selling his services no differently because you have set up special deals with his clients. See below. If you recognise your business model from the description below then the template should be suitable. Both buyers and sellers could be businesses or individuals. Users of your website could be frequent or one-off. Website terms and conditions are probably the best example of a legal document where use of plain English strengthens the legal effect of the document. If a dispute should arise, it would be hard for a user of your site to claim that he did not understand, even if English is not his first language. protect your business from complaints about content that your buyers posted - particularly important if buyers can post product information or interact with sellers without you actively monitoring every post or message. If your site creates a marketplace for services, not for goods. For goods, see Website terms and conditions template: marketplace for goods; buyer side. If there are no restrictions on membership before purchase, then Website terms and conditions template: marketplace for events; buyer side should be suitable. 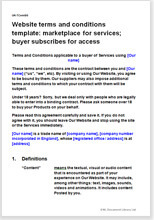 The complementary template that provides terms for sellers of services can be found at Website terms and conditions template: marketplace for services; seller side. The law in these T&C is largely common law that deals with the basics of contracts: offer, acceptance, price and payment, provision of service, liabilities and risk. By and large, you can set the terms you want, particularly the commercial ones. The document should be edited so that it reflects exactly how your business works. Our guidance notes tell you what you can and cannot change safely. Because buyers are likely to contribute content to your site (such as product reviews, forum posts and comments) we have included a large menu of provisions relating to user contributed content within the sections that form an Acceptable Use Policy. Very extensive options as to what a buyer may or may not do on your website. Over 3,100 words of drafting notes to help you.